Russia cedes Ingria and Kexholm County to Sweden. During Russia's Time of Troubles, Vasily IV of Russia, besieged in Moscow by the Tushino gang and driven to despair by the ongoing Polish intervention, entered an alliance with Charles IX of Sweden, who was also waging war against Poland. The tsar promised to cede Korela Fortress to Sweden in recompense for military support against False Dmitry II and the Poles. Thereupon the Swedish commander Jacob de la Gardie joined his forces with the Russian commander Mikhail Skopin-Shuisky and marched from Novgorod towards Moscow in order to relieve the tsar. Sweden's involvement in Russian affairs gave King Sigismund III Vasa of Poland a pretext to declare war on Russia. The Poles engaged the combined Russo-Swedish forces at Klushino and destroyed most of the Russian force; the Swedish mercenaries taking part in the De la Gardie Campaign (July 1610) surrendered. The battle had serious consequences for Russia, as the tsar was deposed by boyars and the Poles occupied the Kremlin. ^ Nina Ringbom. "Ingermanländska kriget". historiesajten.se. Retrieved November 1, 2018. ^ a b c Željko., Fajfrić, (2008). Ruski carevi (1. izd ed.). Sremska Mitrovica: Tabernakl. ISBN 9788685269172. OCLC 620935678. Baron Carl Carlsson Gyllenhielm was a Swedish soldier and politician. He was made a baron (friherre) in 1615, appointed Field Marshal in 1616, Privy Councilor in 1617, Governor General of Ingria in 1617 and served as Lord High Admiral from 1620 until his death. Field Marshal and Count Jacob Pontusson De la Gardie was a statesman and a soldier of the Swedish Empire. The Treaty of Stolbovo is a peace treaty of 1617 that ended the Ingrian War which had been fought between Sweden and Russia between 1610 and 1617. The Gdov Kremlin is located on a bank of the Gdovka River, overlooking the Russian town of Gdov. Russia-Sweden relations date back to the 10th century; when Swedish Vikings called Varangians founded new states that were later to evolve into Russia, Belarus and Ukraine. 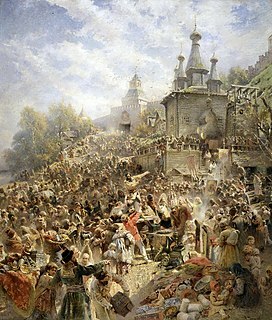 Siege of Pskov was an episode of the Ingrian War. The Battle of Bronnitsy was part of the Ingrian War. Siege of Gdov was part of the Time of Troubles and an episode of the Ingrian War. The Battle of Gdov in the Russo-Swedish War took place on September 16, 1657 in Gdov. The battle was a clear victory for Prince Ivan Khovansky of the Tsardom of Russia over Swedish Governor-General Count Magnus De la Gardie allowing the Russians to regroup after a brief resurgence of Swedish resistance.